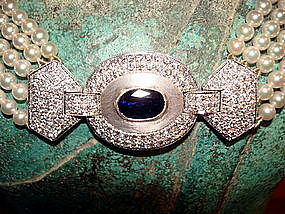 Spectacular genuine Sapphire and Diamond Necklace 18K. Avant-garde and spectacular 18. 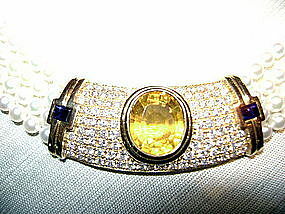 K. Gold (91.1 grammes) Neckband set with 1 Blue Sapphire @ 1.67 ct., 1 Yellow Sapphire @ 2.50ct. (both Ceylon), 43 Diamonds @ 2.41 ct. total weight and 18 Diamonds @ 2.32 ct. total weight(VVS1). New. All our gemstones are guaranteed genuine. An important piece of jewelry! Very elegant cultured white pearl necklace, 3.5-4mm. 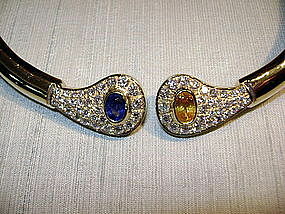 (Japan), set with 1 genuine Ceylon Blue Sapphire @ 2.72 ct. and 188 Diamonds @ 2.53 ct. total weight. 18 K. White gold. New. 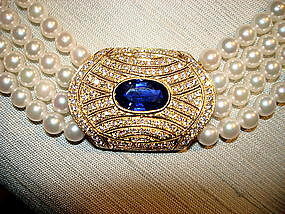 Stunningly beautiful cultured Pearl Necklace (6.5-7mm., Japan), with 18 K. Gold and 1 genuine Blue Sapphire (Ceylon) @ 1.70 ct., 22 Rubies @ 3.14 ct. total weight, 75 Diamonds @ 1.50 ct. total weight, as well as 18K. Gold links set with 40 Diamonds @ 0.60 ct. total weight. New. Sensational & Unique! 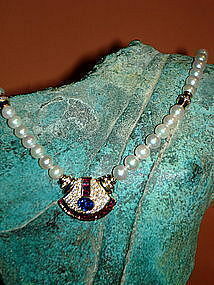 Very elegant & important white cultured Pearl Necklace with 4 strands 3.5 - 4 mm. diameter (Japan), set in 18K. Gold with 1 genuine Yellow Sapphire @ 7.05 ct. and 2 Blue Sapphires @ 0.59 ct. total weight (both Ceylon), 94 Diamonds total weight 1.75 ct. New. Formal and stunning! 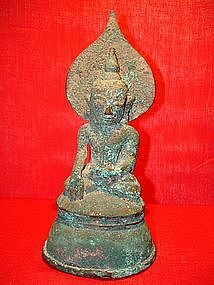 Very rare bronze Buddhist Sculpture with Nimbus, Mon Cultre, 17th Century, Burma, with verdigris patina. 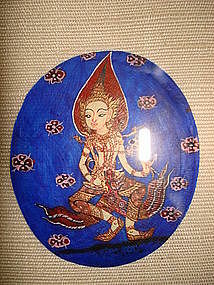 The nimbus (halo of light) is a strong characteristic of the Mon style. Good condition overall, Size: H. 14cm x W. 6.5cm at base x D. 5.5cm at base. Such fine pieces are very hard to come by. 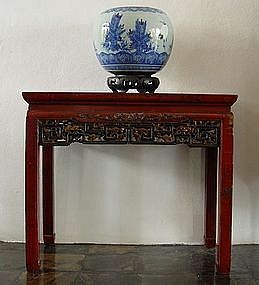 Decorative Fujian red lacquer console table with horse hoof legs and fine carving. Size H. 25" x W. 29" x D. 14" Some wear due to age. 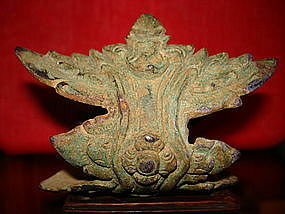 Extremely rare 19th Century Siamese wooden boat paddle, black and red lacquer paint patina with finely painted Golden Dragons and motif decor on both sides, good condition with some minor retouching due to age, Size 48" x 9"
Most attractive, sought after and rare Post Pagan Shakyamuni Bronze Buddha, 14th Century, Burma. 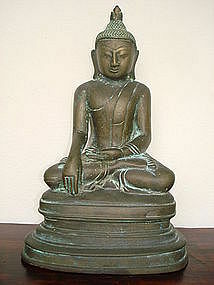 Very good condition, Size H. 26 cm x W. 17 cm at base x D. 11 cm at base. 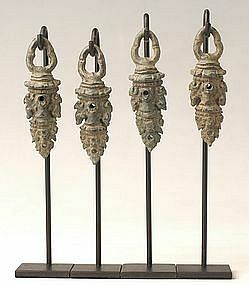 2 Pairs of very well preserved and extremely rare Khmer Bronze Earrings, ca. 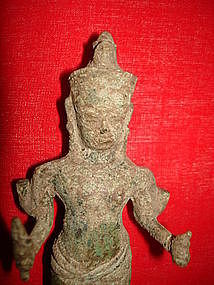 12th Century, Angkor Wat Period. 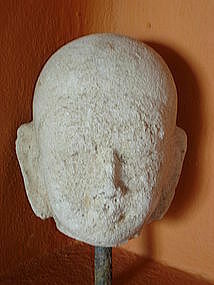 Size: H. 7.3cm x W. 2.2cm. Individual stands for display provided. 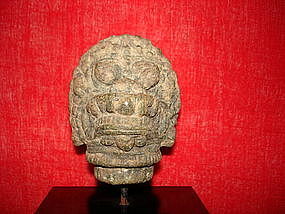 Khmer Bronze Lion Head, post Bayon Angkor Wat, 13th C.
Extremely fine original miniature painting on thin slab of mother-of-pearl, depicting celestial Buddhist beings, angels, musicians from Thai temple frescoes or the famed Ramayana. Each miniature is different and as we have a large collection, exclusively painted for us, please ask if you are interested in seeing more. 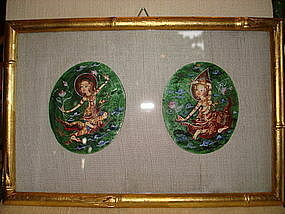 Individually framed on 100% Thai Silk, Glass and 24K. gold leaf Frame. Overall size: 16 cm x 16 cm. 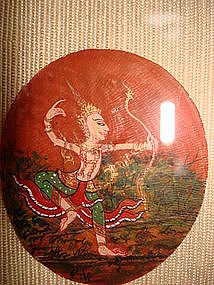 Mother-of Pearl Medallion measures 6 cm x 5 cm. Artist: Manat Pomseranee.